At Terrace Homes, we have spent the last 40 years improving on our innovative, efficient building method. We continually strive to do it better, faster, and smarter. Our indoor building approach ensures ever-dry construction and guarantees the structural integrity of your home. Protection from outside elements, heat and moisture eliminates the risk of mold growth and warping throughout the construction process. We also offer solutions that are exclusive to Terrace Homes, such as our no mold threshold, which virtually eliminates floor rotting – a very common occurrence for traditionally built homes that are subject to weather conditions. Energy efficiency is something we take seriously as well. Our homes are carefully crafted with weather-tight construction, implementing top rated energy efficient windows and doors. 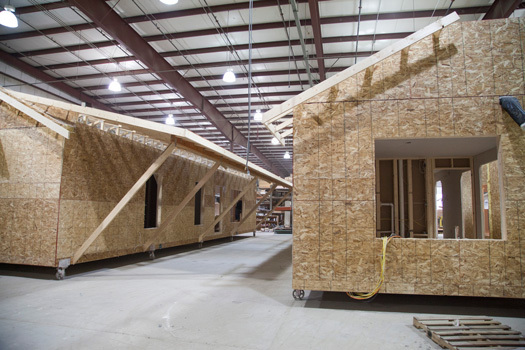 Our sustainable craftsmanship achievements began early in our career, when we led the way in pioneering the 6” exterior wall/energy truss combination that’s since become the standard in the industry for energy efficiency. Our construction and building standards exceed code minimums and contribute to the lasting integrity of each Terrace home.